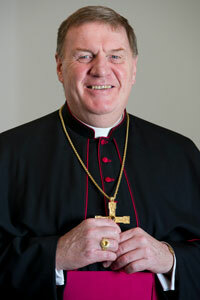 About Archbishop Joseph W. Tobin, C.Ss.R. Born 3 May 1952 in Detroit Michigan, the eldest of thirteen children of Joseph W. Tobin (†January 28, 1977) and Marie Terese Kerwin. Baptized May 8, 1952 at Holy Redeemer Parish, Detroit. 1970-75: Holy Redeemer College (Waterford, Wisconsin), BA Philosophy (1975). 1977-79: Mount Saint Alphonsus Seminary (Esopus, NY), Masters Religious Education (1977); Masters Divinity (1979). June 1979 – July 1984:	associate pastor, Holy Redeemer Parish, Detroit MI; principal responsibility was the pastoral service to the Hispanic community; occasional service as retreat preacher, Cursillos de Cristiandad and youth ministry. Other responsibilities in the Archdiocese of Detroit: episcopal vicar (1980-86), presbyteral council (1985-90), official in the metropolitan tribunal (part-time, 1980-90). July 1984 – July 1990: pastor, Holy Redeemer Parish. August 2, 2010: named by Pope Benedict XVI as the Archbishop Secretary of the Congregation for Institutes of Consecrated Life and Societies of Apostolic Life and as titular bishop of Obba. October 18, 2012: named by Pope Benedict XVI as Archbishop of Indianapolis. November 7, 2016: appointed as the Archbishop of Newark, N.J.
January 6, 2017: installed in Newark, N.J. Speaks English, Spanish, Italian, French and Portuguese; reads several other languages. Appointed by Holy Father to five Synods of Bishops (1998, 1999, 2001, 2005, 2008). Canon Law Society of America, member since 1985.